First of all, apologies for my picture quality! 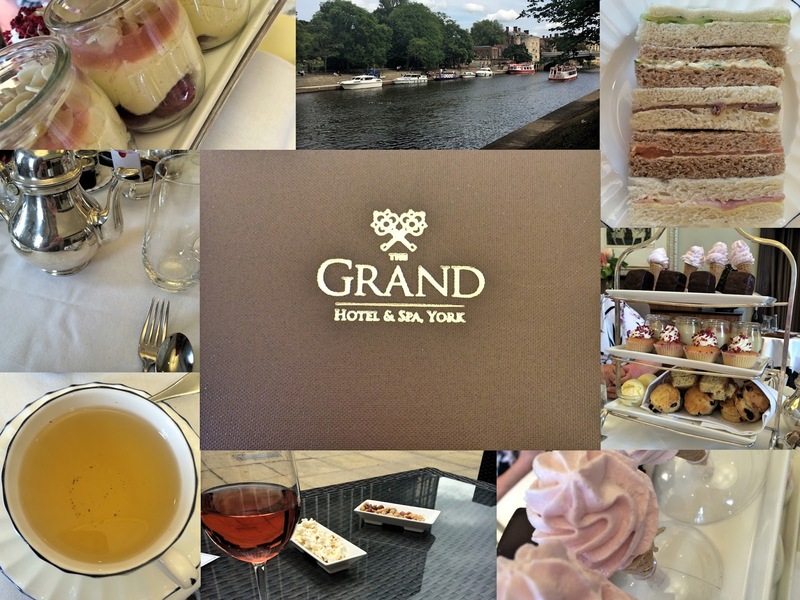 As this was a family affair, I actually didn’t intend to blog about it but it was so amazing I just had to tell you all about as I think The Grand Afternoon Tea at The Grand Hotel & Spa in York. Located just inside the historic Roman walls, The Grand Hotel & Spa respects the buildings heritage (first opened in 1906 as the headquarters of The North Eastern Railway) and yet still appears very modern and well presented. I love the art deco design features that have been used to help the hotel keep it’s period charm (the lifts are all mirrored inside and amazing, and the central stair case and corridors could be straight out of The Great Gatsby!) and the exterior floors use locally sourced Yorkstone, tying the hotel into it surroundings perfectly. Arriving slightly early for our afternoon tea, we decided to head out onto the terrace for a few drinks in the mid-afternoon sun. The terrace is a rather large area to the rear of the building with views of the nearby walls, furnished with sleek and stylish dark wicker furniture, adorned with white cushions. To my delight we were offered popcorn with our drinks and before long we were shown through to our table in the Hudsons Restaurant where our Afternoon Tea would be served. To start with we were all offered a hot beverage, I opted for the Moroccan Mint Tea, whilst Paul chose an Italian Roast Coffee (which I must add smelt delicious) and our finger sandwiches and cakes quickly followed. On this day my diet temporarily went out of the window as it quite rightly should on such an occasion! The tea’s and coffee’s flowed, dainty sandwiches (filled with Cucumber & Dill, Egg Mayonnaise & Watercress, Roast Beef with Black Pepper & Mayonnaise, Smoked Salmon with Soft Cheese & Chive and Ham & English Mustard served on a selection of White or Malted breads) were devoured and the cutest cakes and desserts were demolished. on our cake stand we were offered Peach Melba Pots, Victoria Sponge Cakes, Peppermint Chocolate Delice, Strawberry & Elderflower Cones, Lemon Drizzle Cakes and of course Scones with Clotted Cream & Jam! Once we felt suitably fattened up, we headed out for a short walk along the City Walls and the River Ouse before heading back to enjoy a quick cocktail before heading home. Despite the hotel bar being full of race goers who had enjoyed the afternoon at the local racecourse, we managed to find a quiet table to sip our drinks at. Until that day I had never heard of The Grand Hotel at all and I have so say it’s a little hidden gem and a real oasis of calm in the hustle and bustle of the busy city. Afternoon Tea at The Grand starts from £23.50 per person and you can find out more about the hotel and what they have to offer here.